An obscure swatch of human DNA once thought to be nothing more than biological trash may actually offer a treasure trove of insight into complex genetic-related diseases such as cancer and diabetes, thanks to a novel sequencing technique developed by biologists at Texas A&M University. The game-changing discovery was part of a study led by Texas A&M biology doctoral candidate John C. Aldrich and Keith A. Maggert, an associate professor in the Department of Biology, to measure variation in heterochromatin. This mysterious, tightly packed section of the vast, non-coding section of the human genome, widely dismissed by geneticists as “junk,” previously was thought by scientists to have no discernable function at all. In the course of his otherwise routine analysis of DNA in fruit flies, Aldrich was able to monitor dynamics of the heterochromatic sequence by modifying a technique called quantitative polymerase chain reaction (QPCR), a process used to amplify specific DNA sequences from a relatively small amount of starting material. 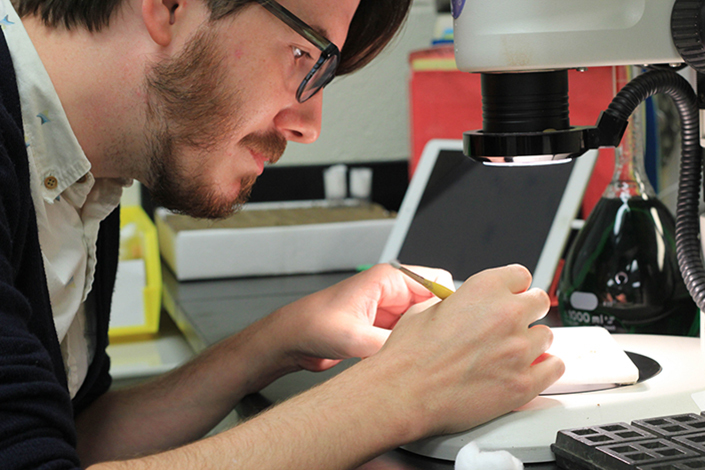 He then added a fluorescent dye, allowing him to monitor the fruit-fly DNA changes and to observe any variations. Aldrich’s findings, published recently in the online edition of the journal PLOS ONE, showed that differences in the heterochromatin exist, confirming that the junk DNA is not stagnant as researchers originally had believed and that mutations which could affect other parts of the genome are capable of occurring. “We know that there is hidden variation there, like disease proclivities or things that are evolutionarily important, but we never knew how to study it,” Maggert said. “We couldn’t even do the simplest things because we didn’t know if there was a little DNA or a lot of it.